I thought I was rather odd for having an interest in old car factories but I have found that there are a number of people on this site with the same curiosity. I have included a shot of a factory where the Warren Motor Car Company was located. I believe the building is still in use on Holden and the railroad. (It's the third picture) Most of my research comes from a book by R. Szudarek called "How Detroit Became the Automotive Capital." It's a great book. I am trying to identify the buildings in the other pictures. The red brick building is by the Lodge perhaps on Holden and the other might be on a street called Commonwealth or Avery between Rosa Parks and the Lodge. Next month when the snow is gone, I'll take a picture of the Rickenbacker factory. This is indeed the right place to talk about old factories. 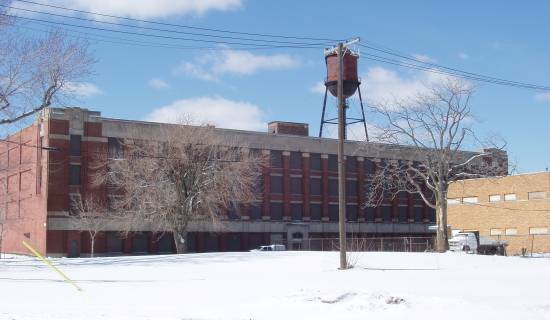 While we're at it, what's the big empty factory east of the Lutheran Cemetery on Mt. Elliot? The Packard Plant is on the eastern border of the Lutheran (Trinity) Cemetery. Sven, I have to leave town for a few days, but I'll try and get you some info when I'm back. Sven: There are many of us who are interested in the automobile industry in Detroit, the people who made it happen, the buildings, and the cars themselves. Must have been great living and working in a city bustling with industry. All the key companies right here in your neighborhood.... We have fallen off so far. You got that right. Hundreds of thousands of workers could walk or take a bus to work. There were small and large shops everywhere, cars and car parts going from plant to plant, half-done vehicles driven down city streets between fab shops. People invented things in their garages hoping the auto moguls would pick them. And then there were support shops. jjaba's father made envelopes for the auto companies, somebody else made paint or tires. 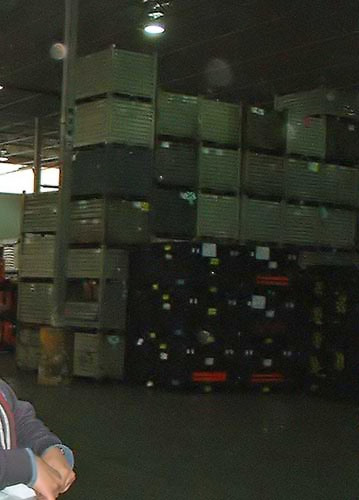 There were tool and die shops, chrome plating plants, car frame makers, etc. jjaba, Westsider, who grew up in the shadows of Nash-Kelvinator, Ford-Rouge, Detroit Diesel, Holley Carbeurator, Vickers, ExCello, Desotos and even the Edsel plant. When inserting the tags in your posts seperat them with a return and do not put tags at the end of text. it does funny things in different browser windows. Not bitching it is a pain to learn. Once you get used to draging the photo tags around your posts you will think nothing of it. Check out the formatting section for more info. This is what your post could look like. I thought I was rather odd for having an interest in old car factories but I have found that there are a number of people on this site with the same curiosity. I have included a shot of a factory where the Warren Motor Car Company was located. I believe the building is still in use on Holden and the railroad. Most of my research comes from a book by R. Szudarek called "How Detroit Became the Automotive Capital." It's a great book. and the other might be on a street called Commonwealth or Avery between Rosa Parks and the Lodge. And thanks for the pictures and info. Keep it coming. "Incidentally, I restore the cars that came out of these old factories......"
Lets face it 31Ford, its more of a sickness than a passion isn't it? I own two cars built at the Norwood, OH F-body plant and a Challenger built up in Hamtramck. I have since reverse engineered 2 of the 3....meaning I tore them apart as much as I could. Don't ask why, its again part of the sickness. 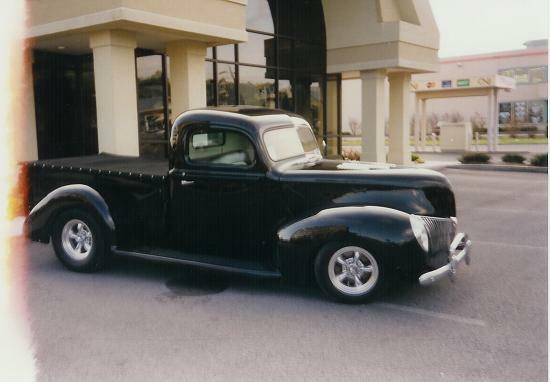 You may dig this, its my friends 41 Ford pickup. That's a fine ride, clean and simple. It's hard to improve on those lines! 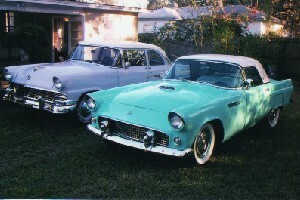 Here's a pic of my '55 and '56 Fords both were built at the Rouge. Sweet! I'm sure you've seen mine on here right? I think so Sport,, tho it's been awhile got any new pics? Thanks Toolbox for the tips. The whole picture posting process is new to me. Tell ya what, bought my dad a 5.1 mega pix camera for christmas, and I'm heading down there this weekend. If I got time, I'll push the cars out and get some good pics in their current state....not running/torn apart. Sven, welcome to the forum and thanks for a good thread. I cleaned up your posts. Just to add to Toolbox's comments, you can click the edit icon [notepad with pencil] in the upper right over every post if you need to make changes. This fits nicely with the Continental thread. 31 Ford, that Rouge badge is to die for! Excellent thread. Keep up your great work. Any pics. on the Westside would add some classe' to the thread. It is a sickness when the cars are torn apart all over mom and dads garage. It is a passion when they roll out of the shop to a greatful customer. Actually, its my garage. It simply resides on their property. There's an old long factory on Shoemaker across from a Detroit bus garage. It's very close to WCCC. Does anyone know the history behind the building? Here is a good resource to dig through for your research. Here is another good one to try. There is a wealth of photos and information on Detroit area industry. Use the search. For instance, you Mopar fans, try "dodge main". They have 400 photos and documents regarding the Dodge Main plant- just prior to demolition in the early 80's. There is very little in the way of photographic information regarding this plant. Believe me, I looked all over while researching some Dodge products I have been restoring. In my above post I also located 1970ish photos of Fisher 12 (not 21). Does anyone know if it still exists at 1961 E. Milwaukee? The city records show no listing for 1961. There is a 1950 that was built in 1928. That area is at the bend of East Grand Blvd. The property map also shows no vacant lots, so there's a chance it might still be standing. Bate, part of Fisher was demoed for I-75. Maybe Fisher 12? Anyway, the lot across the street is/used to be DWSD property. 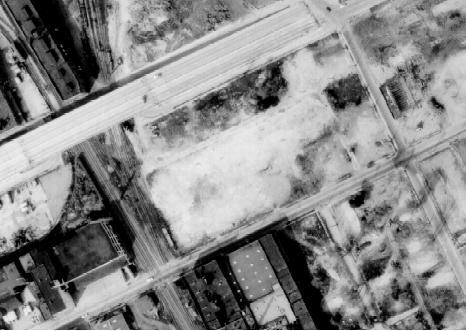 The city's master plan from 1951 lists a Hern Yard (still there on the freeway service drive); a St Jean Yard and incinerator located at St Jean and the DTRR; and a French Raod Yard and asphalt plant, located at French Rd and the DTRR. Could the stacks behind WCCC be part of the incinerator or asphalt plant? The factory is across the tracks (southwest) and probably has no relation to these other properties. Great map. Yep, that's the place. It seems really long to be an incinerator although it does have two smokestacks. In old arial photos there seems to be a parking lot to the east with a lot of cars. (unintended pun) Sometimes I feel like a cat trying to figure out what some of this stuff is. Cats hate closed doors. "What's behind that door? I have to know." I was told that I could go the the Detroit library and look up locations in something called the Sanborn Maps. That would tell me who owned the property. I haven't done that yet but I will someday. 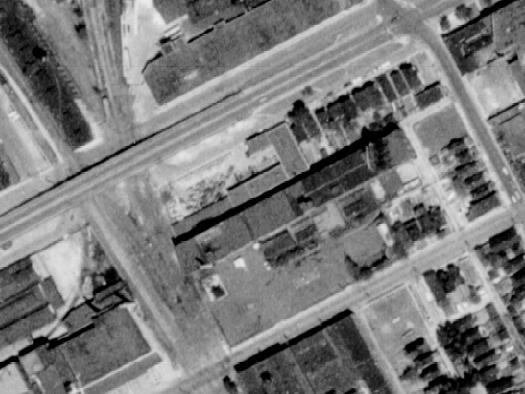 Here's a satellite photo of 1961 E. Milwaukee from Terraserver. Interpretations, anyone? http://lcweb2.loc.gov/ammem/co llections/habs_haer/ (Type in Detroit Fisher as a search) it looks like a skinny little mill style building. Maybe the thin one just south of the thumbtack. That being said, the address of that building is the one listed as 1950. It looks like the building is gone. In reference to the arial photo, the street north of Milwaukee is East Grand Blvd. There is a long white building next to a vacant lot. There used to be a factory there four years ago. Does anyone what either one of these buildings were? Mistery solved. Now you see it, and not you don't. Thanks. I had some time to go through more of the haer listings in my post above- many immages have yet to be processed for viewing. Hopefully they get to it eventually. It's nice to see tax dollars at work. 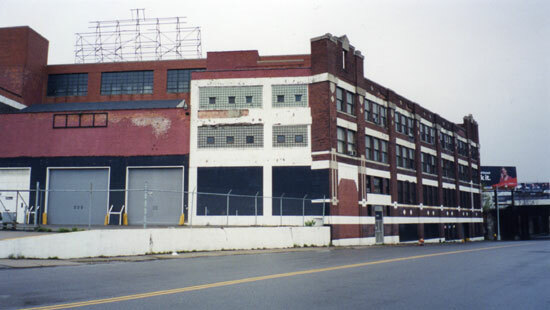 Hudson had three factories in Detroit: assembly, body, and gear/axle plants. Assembly was on Jefferson at Connor, one of the other two is on Connor at Harper, where is the third? It was in the second basement of the Hudson's store, recently demoed. Comparing mikem's historic images to track75's 2002 terraserver link, you can see the Fisher 12 location now has a more modern building on the site. 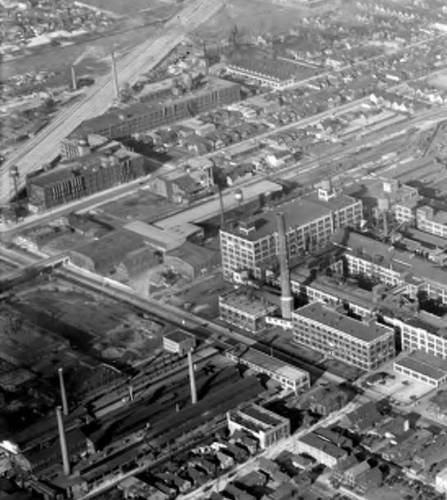 Just north west in the terraserver image is the (now) Russel Industrial Center buildings where, depending on year, Anderson Electric Car, Hupp, & Murray were located. Does anyone have a more complete listing of auto plant addresses for the terraserver. I can locate most of the obvious sites but could use some help on the obscure. My desk is like a messy college professor's; stacked with books and papers. Somewhere in all of it I have quite a few factory locations and histories, and putting it all together on one map has been a goal that I keep getting distracted from. 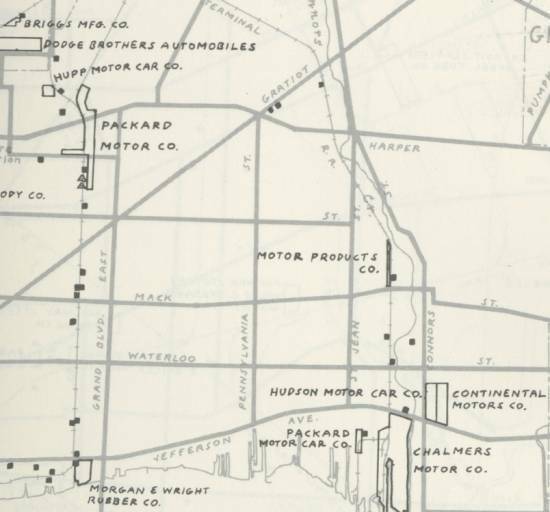 Here is map of factories in the transportation industry in 1920. To get it to fit the posting limit, I had to chop it into pieces. 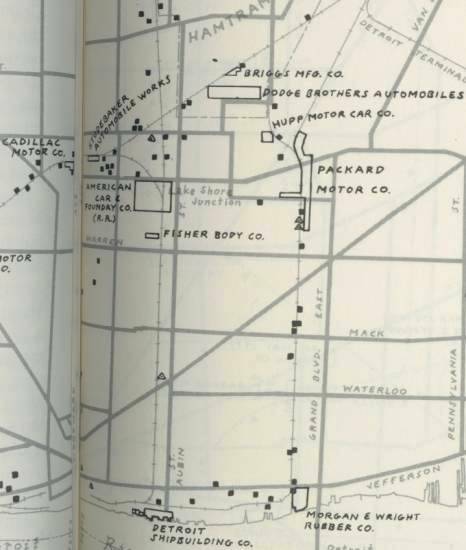 In the same book this is from are similar maps of factories producing: Industrial Goods; Metal Work; Chemicals, Fuels, and Construction; and Consumer Goods, all from 1920. Below, factories that occupy a block or more are named. Other factories in the auto industry are shown with black squares; shipbuilding, open squares; tires and wheels by a circle with a dot in the middle; and railroad cars and airplnes by a triangle with a dot in the middle. 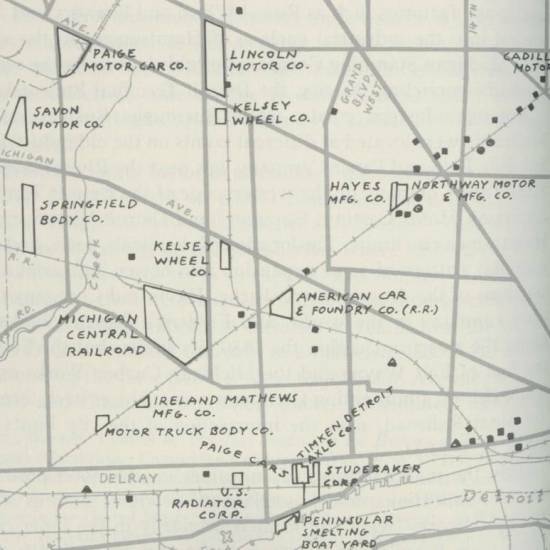 George Baist's "Real Estate Atlas of Surveys of Detroit and Suburbs"
Burton's "City of Detroit, 1701-1922"
and Polk's "Detroit City Directory, 1920"
This map came from Oliver Zunz's "The Changing Face of Inequality". Robert Szudarek's "How Detroit Became the Automotive Capital" is probably the best single source available without digging into library or corporate archives. Sometimes, they're right under your nose! What is listed as Morgan E. Wright Rubbber Company on E. Jefferson became United States Rubber, then Uniroyal. Would that be an accurate statement? 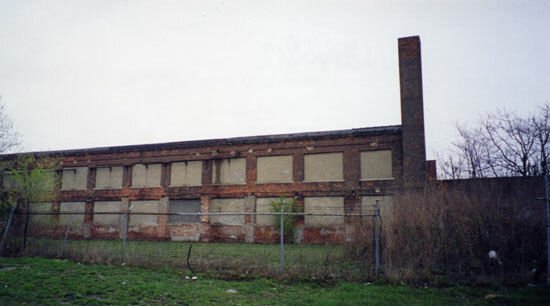 In the 1960s, jjaba's father ran an envelope factory on the first floor of the Russell Manufacturing Center at Russell and Clay. Russell is also the service drive for I-75 at that point. Ofcourse, it is listed as Murray Body Works on your map. By the 1960s, the complex was leased out to smaller businesses. Our business was called Cupples-Hesse Envelopes, a branch plant out of St. Louis. The St. Louis location was on Kings Highway as I recall. Mikem, thanks for the map. I have a copy of "How Detroit Became the Automotive Capitol" on the way from a bookseller. I'm looking forward to receiving it. Another good title is "Auto Factory" which is still in print- try Amazon or alike. It seems like there are a few of us here with similar interests regarding the history of the auto industry. It's great there are resources like this available. Fabulous Ruins of Detroit is one of my favorite places to visit on the web. Is anyone on this thread is interested in swapping copies of media on auto related subjects? If acceptable I will post a email address to pm me. Great map! When the snow clears, I'll head on down to take pictures of anything that might still be standing. I know the factories around the Ambassador Bridge have all been torn down. Last year I saw a scary sign that said, "Road closed. --Office of Homeland Security." Thanks Sven. One good thing about the snow though, is it covers up a lot of stuff that I wouldn't want to drive over...broken glass, scrap metal, etc. Also, a lot of the weeds and brush that hides building is dead or beaten down. 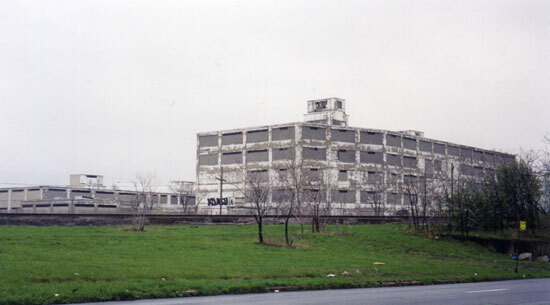 I took a drive over by the Warren Auto factory yesterday. This building was across the street. It looks like a school from the front, but the back end looks industrial. Anyone know who or what Norton was/did? Bate, you'll find a lot of good info in Szudarek's book, but it isn't written very well. It's organized chronologically and there's no index, so hunting for info is a bit time consuming. jjaba, you are correct. The "E" is actually an "&", so it's Morgan & Wright. 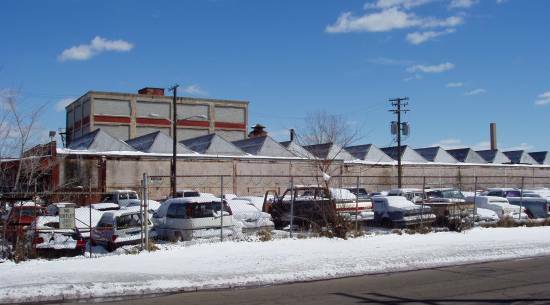 Just south of the I-94/Grand River intersection is a complex of industrial buildings that extends south to W Warren, between Loraine and Lawton. 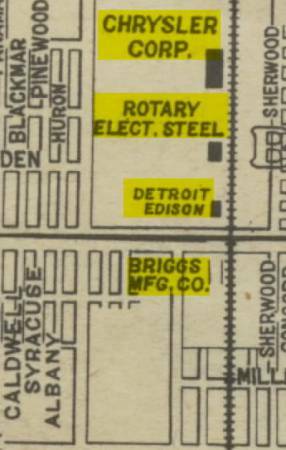 This factory below is across Warren from the DFD School (the square just above the "N" in Northway on the first map above). I think it was a mattress factory at one time. Any idea what it was originally? My grandfather worked at U. S. Rubber for many years. You have the history correct. But you don't know the whole story until you've smelled a tire factory! 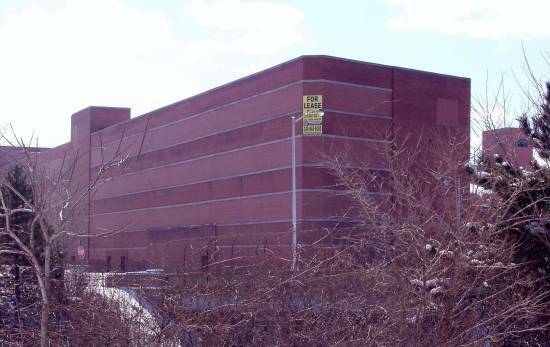 Does anyone have any interior pics of the Highland Park Ford plant? I have photos from the heyday, but it would be neat to see present day photos. Roberts moved to Detroit, where Briggs had set up the new "LeBaron-Detroit Company" on Meldrum Avenue to build "semi-custom" bodies generally in runs of five to twenty for Lincoln, Packard, Chrysler, Stutz, Graham-Paige, and others. Briggs apparently had 10 factories around Detroit at the time Chrysler bought them in 1953. 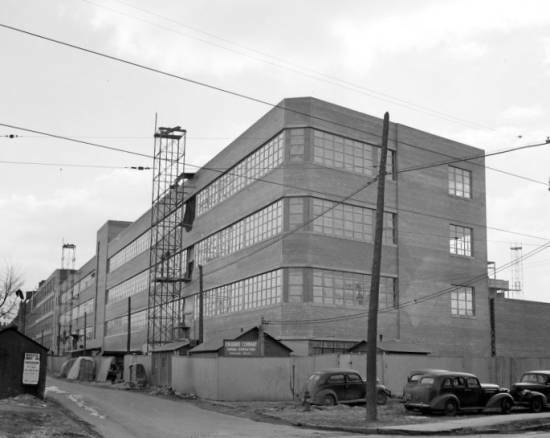 Their main body factory was on Mack where the Chrysler Engine plant is now (Mack @ St. Jean), but that was originally a Motor Products Compay plant. What is the history between Motor Products and Briggs? Where are the other Briggs plants? Sadly, this recycling happened with other company records as well, including Kahn's. This is a very interesting thread,, gets more int. each day. anyone want to see some interior plant photos of various Ford & Lincoln eras? How many days do we have to wait until posting? 31ford, I have not seen any current interior photos of Highland Park ford on the web. I checked with some of the urban explorer types (ones with exterior photos on their sites) and it seems to be well guarded and is being used in someway, at least partially. When I was there last January I took some exterior photos. 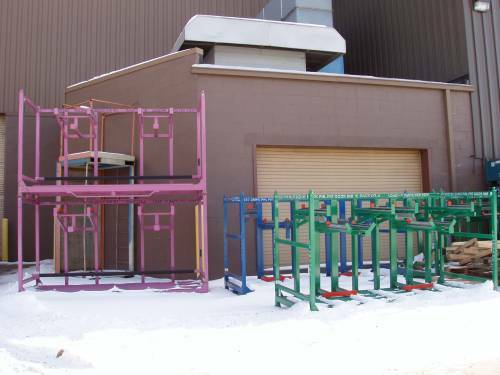 Lots of fixtures and parts racks along the road at the rear gate. Anyone know what year or cars were last produced at HP? If 31ford is offering, I would like to see some interior photos of Ford & Lincoln plants. Since there is a limit on bandwidth here, possibly a link to a photo share site? Same for anyone else. It sounds like more than a few on this thread also have photo collections to share. The main portion of the plant is used for records retention. 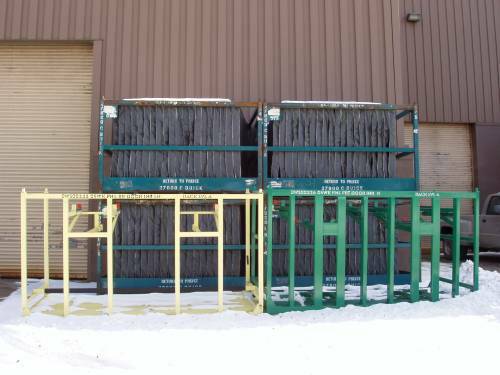 The exterior yards are used for storing dunnage. HP was producing tractors in a portion of the plant and the main office and engineering areas were used by an auto dealer. As I said earlier, 10 Briggs factories in town. Ford last produced cars at HP in the Mid 30s. However assemblies of small parts, ammeters, distributors, etc continued to be put together here. 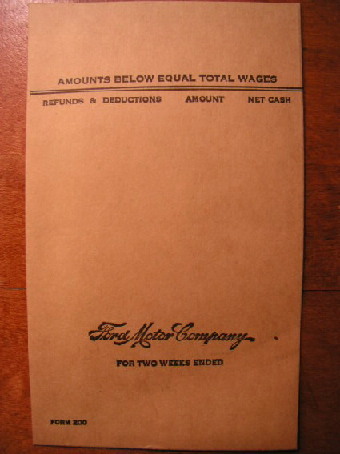 Ford transferred 90% of its auto production to the Rouge during the change over from the T to the Model A(early 27-28). I'll dig thru my stuff and find some decent pics to post. 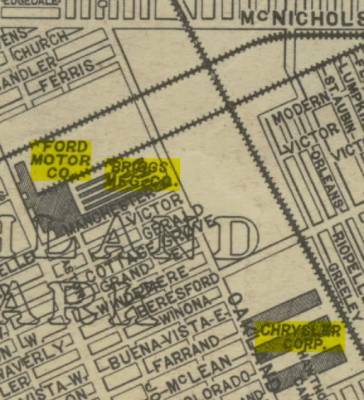 The best pics are in "Ford Industries" books, published in 1910s & 20s, I have 1917, 1924, 1926(showing Highland Park) and 1929, 1931 (showing the Rouge)books. Also lots of postcards from the 10s-20s-30s. Always looking for other Ford books! The Norton building on Lincoln is interesting. I drove by it today. 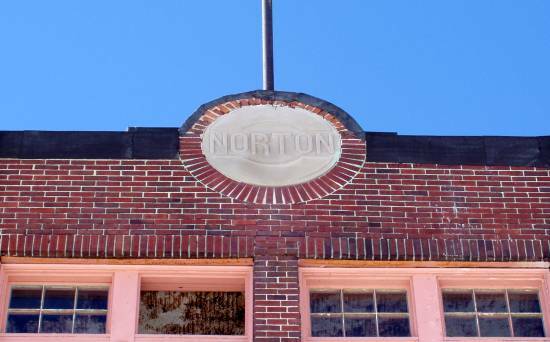 I think there was a Norton pump company but they were headquartered in Illinois. Where was the Norton gun sight made? There is also another factory right behing the one in the picture. That street is Trumbull. The white building (see picture way up top)that I asked about when the thread first started is on Rosa Parks (12th street.) Back in the mid-80's, I was at a party at a Briggs plant. A guy stored movie props there plus it was a car collector garage. It burnt down though. I can't remember where it was. Toolbox, connect your word "dunnage" to cars. Is this the one behind the Norton, at 5757 Trumbull? Not sure of its original purpose, but it served as a warehouse for the Leonard Archives Co, an early corporate records storage firm. 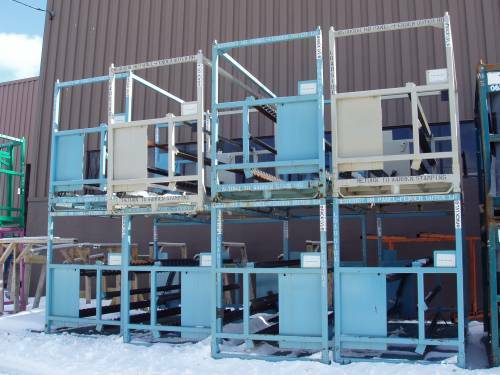 They were bought by Iron Mountain, who still uses it today. The north side of the water tank has a large "W" in the center of a circle, but the paint is too faded to read what the surrounding script says. The current users use it for archive storage as well. The bombsight you're thinking of is Norden. They pre-date the war by a decade and were made in several locations. 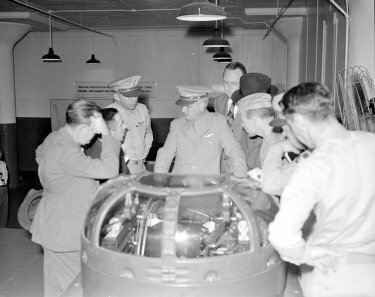 I think Burroughs is the only one in Michigan to produce them during the war. 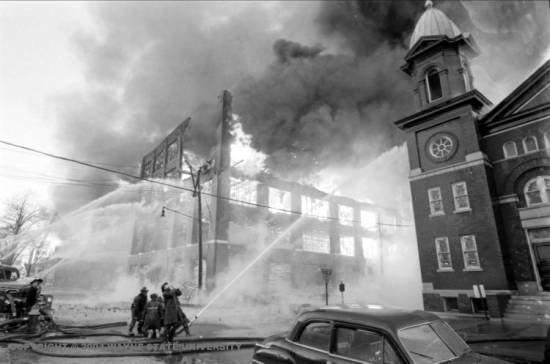 I remember an eastside factory-turned-warehouse burning in the early '80s, somewhere north of I-94, east of I-75. I remember it had a classic car collection in it among other things. I parked and wandered down a set of railroad tracks to watch it burn from the backside when suddenly there was a shift in the wind, and I got a lung full of ammonia gas. My eyes immediately teared-up so that I couldn't see and I ran back towards my car at full speed feeling that if I wasted one extra second, they'd find me dead on the tracks from asphyxiation. My guess is that it was the Briggs factory on the north side of Dodge Main. Mike M, that would have been the end of a career in aviation. After a trauma like that, it's no wonder you weren't exiled to Eliose somewhere pulling up weeds in the springtime. The representation of Westside industry illustrates the incredible history over here. Kelsey-Hayes, Vickers, Micromatic Hone, Schedds, Ford Rouge, Holley Carbeurator, Lincoln-Mercury-Edsel, Sanders, Wonder Bread, Turnsteds, Cadillacs, Desotos, GM diesel, Massey-Ferguson, Fleetwoods, Ex-Cello, Ethyl Corp., Nash-Kelvinator, Twin Pines Dairy, Lyndon Steel, numerous Ford plants, numerous GM plants, Howard Flint Ink, etc. Are these dunnage? They come in a nice collection of colors. Martha Stewart would be proud. On the ships, "dunnage" were blocks of wood used to secure cargo. Interesting reference to "lubber dunnage." Detroit, a tonnage of dunnage. you'll be in a tonnage of trouble. Work all day, then hit the bars. This could turn into a great thread if those of us Westsiders get started with our pics., our industrial history, our pride of place. Wait just a minute. The entire Ford Rouge Complex is bigger than the whole Eastside. Consider that! I would think everyone here is familiar with the Fisher 21 plant - or what is left of it - on Piquette. After seeing the condition of the plant last year I have wondered when it was last active. Some say early 90's. 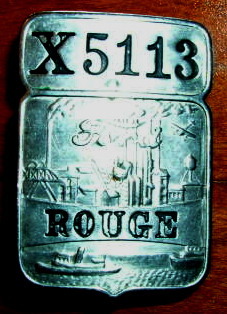 One of the explorer websites posts a photo of build tags for Cadalic Allante (late 80's - early 90's). I located this report http://www.epa.gov/air/opar/au to/pl20.pdf which claims the plant the plant was active making Chevy/GMC vans in 1994. I am unsure if this is correct. It looks to me that the plant is more than 11 years out of use. But who knows? I wonder if anyone can confirm working there in-or-around that time? Something to think about. Fisher 21. Can we have a review of what WAS built there and from which eras? Jabna...haha you hit the wrong key my friend. Good morning to you and what keeps you up this early in the moanin? Very interesting material and information. 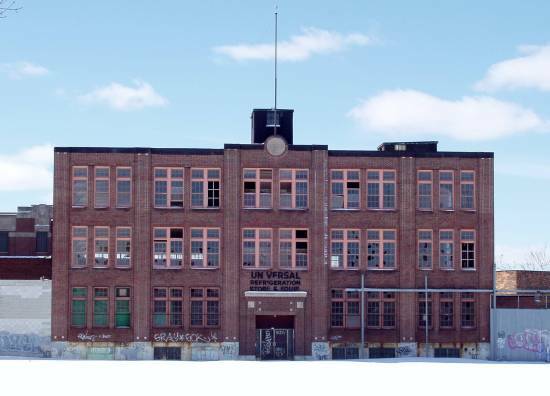 Coming from NJ we have alot of abandonded factories. They closed a Ford plant in Wood Bridge NJ. As soon as they closed it, they demolished it just as soon. Speaking of factories that made stuff for our troops during WW2, in my old hometown of Wood Ridge there's a Curtis Wright plant still there to this date. Curtis Wright no longer works out of the building. But alot of sections of the building are unused and still have equipment there and aircraft parts and engines still inside of the buildings. I am new to this forum but I am hooked by the knowlege you guys have here. I am currently looking for the Dodge Main plant during it's demo. Anyone seen that photo? If so e-mail me please.